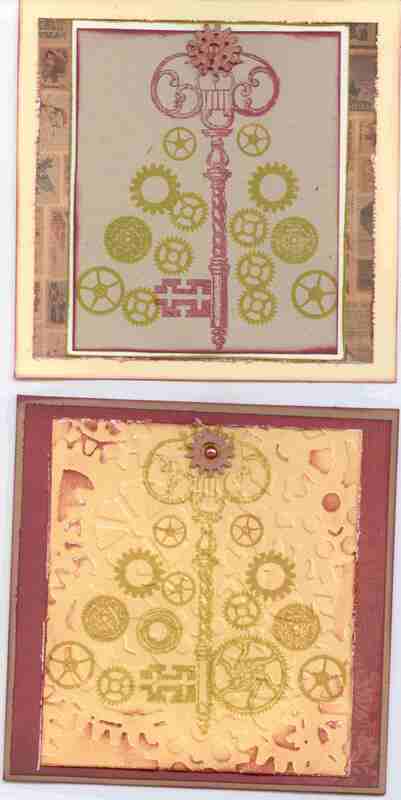 Several versions, all made up with a big key stamp as the trunk and cogs and gears as the branches. I really liked this design, was very happy with it. A wooden cog stained with copper ink had a starring role in lieu of the star on top of the tree. I saw this design in a magazine and was able to adapt it. I spent an evening punching all my paper offcuts into stars so have a big bag to choose from now. The stitching is a stamp which made things easier. This would be very easy to adapt to other occasions also, not just for Christmas. 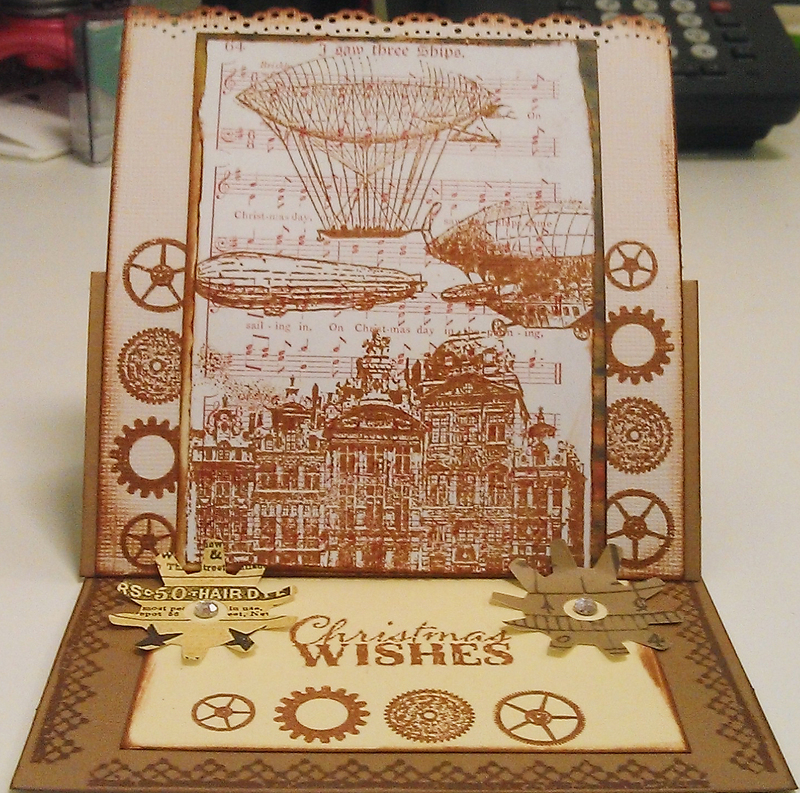 My steampunk christmas easel card, based on the carol ‘I Saw three ships’. This was very complex and described below, along with additional images. Square kraft card, folded at the top. Edged in vintage photo ink, scored across the middle to create the easel fold. 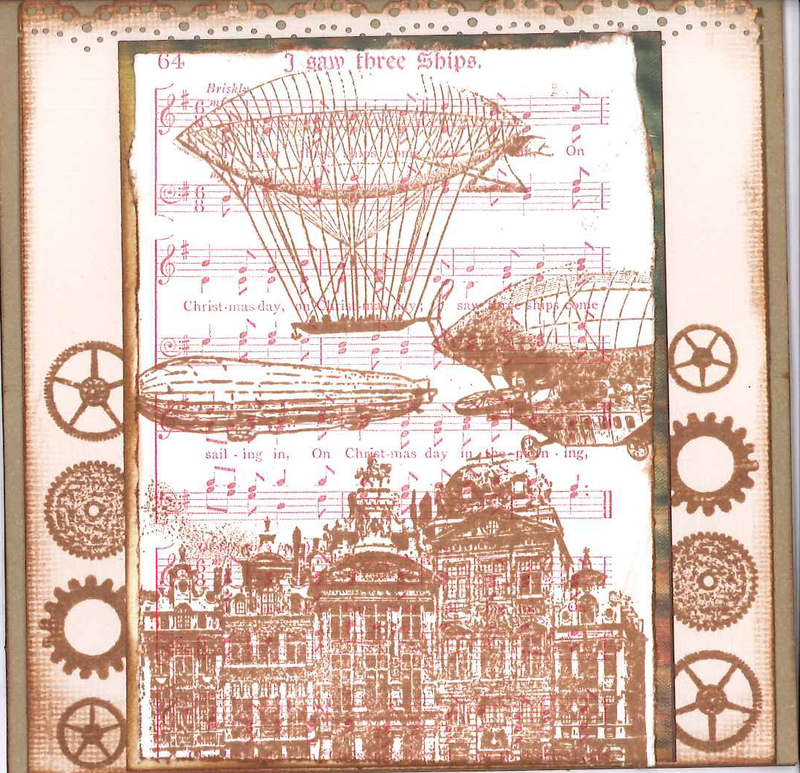 Bazzil basics vanilla panel cut to smaller square size, edged in vintage photo ink, row of cogs and gears stamped along each side vertically. Martha Stewart lace doily edge punch along the top edge. Print sheet music of christmas carol in sepia and trim to size, edging in ink. Stamp the Oxford Impressions House scene at the bottom, and three different airships at the top. Layer on patterned paper, and then onto the vanilla cardstock. Layer the assembled piece onto the kraft cardstock, taking care to only attach it below the fold line. Inside, stamp lace boarder on the lower panel on three sides. 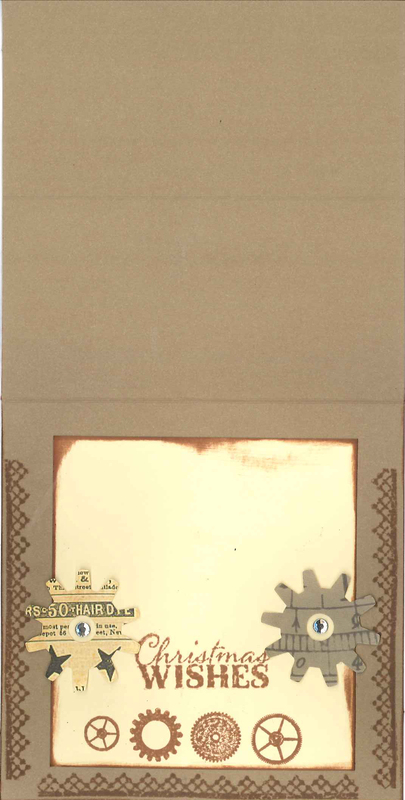 Cut bazzil basics vanilla panel to fit inside the kraft card and edge with vintage photo ink. 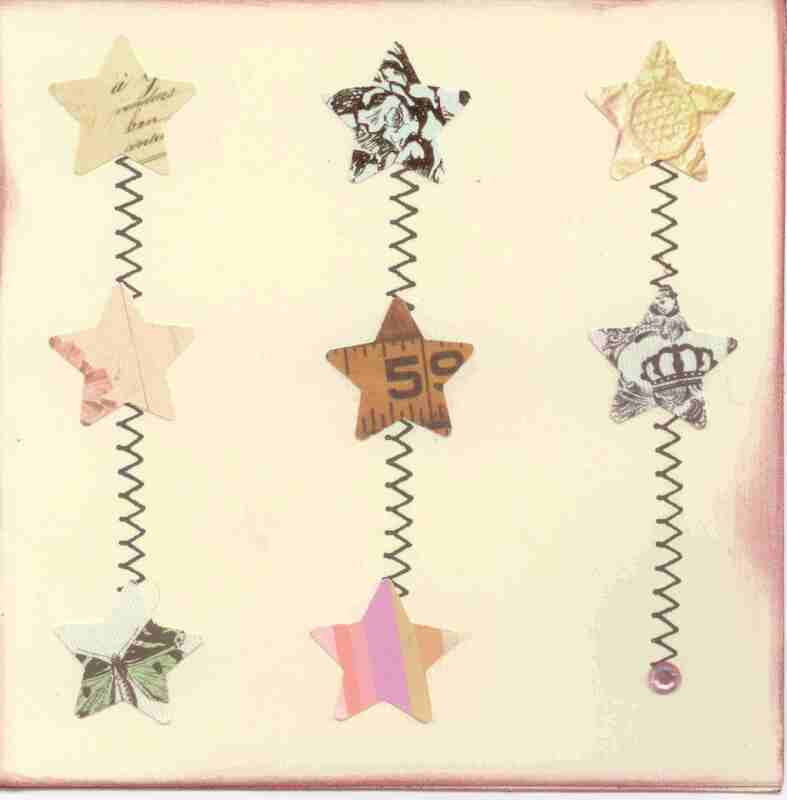 Stamp the row of cogs and gears along the bottom, and Christmas Wishes above it. Place two dye cut gears on either side of the Christmas Wishes stamp, leaving the top spokes of the gears free (fold them up so they are raised a little). Place a gem in the centre of the gears. When the card is folded down the top panel will be tucked behind the gears to hold the easel shape. Hey, I recognise that fabulous art! Though I must confess that Ruby said, stars! I don’t want stars! I want a tree! Also, mine, so beautiful and so incredibly well made. I admire your ability to finish so well. Oh I wondered if they would like the same card then decided to do different ones.